Potato chips are a salty and crunchy snack that are quite popular. 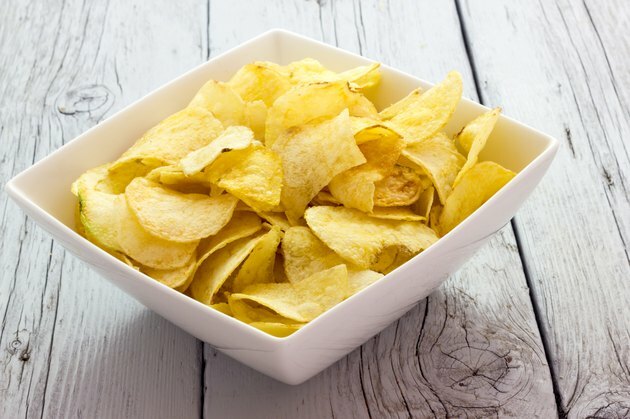 Eating potato chips occasionally is unlikely to negatively impact your overall health, but consuming this snack regularly can lead to your consuming too many unhealthy ingredients and not enough vitamins and minerals. Knowing the negative impact that potato chips can have may encourage you to choose a more nutritious snack next time your stomach growls. Most potato chips contain added salt to enhance the taste. MayoClinic.com reports that too much salt in your diet can lead to several negative health problems, including high blood pressure and kidney disease. A serving of potato chips is about 1 oz., but most people consume far more than that amount at one sitting. A 1-oz. serving of plain potato chips contains 180 mg of added salt. Your body only needs 2,300 mg of sodium per day, and eating several ounces of potato chips can result in your getting too much salt from one small snack. Flavored varieties can have even more added salt. Many brands of potato chips are cooked in trans fats to preserve their shelf-life and achieve the crisp texture that you likely enjoy. Trans fats are the worst and most dangerous fats you can consume, reports MayoClinic.com, because they raise your bad cholesterol while lowering your good cholesterol. Read the ingredient label on your favorite brand of potato chips to see if they contain partially hydrogenated oils. These are trans fats and should be avoided in your diet. If you want to enjoy potato chips occasionally, look for a variety that does not contain partially hydrogenated oils. Even if your favorite potato chips don't contain partially hydrogenated oils, they likely contain several grams of unhealthy saturated fat. MayoClinic.com reports that saturated fats can raise your cholesterol levels and increase your risk of heart disease and type 2 diabetes. A 1-oz. serving of plain potato chips can have between 1 and 2.5 g of saturated fat, and if you eat more than that you will consume many more grams of unhealthy fat than would be in a healthier snack. Potato chips lack nutrients to add any value as a snack. Fried potato chips do not contain healthy amounts of vitamins and minerals to help compensate for the high fat and salt content. While potatoes themselves contain good amounts of potassium and vitamin C, frying them in unhealthy oils can strip these nutrients away, leaving little behind for you to consume. Skin-on potato chips may supply some fiber and protein, but not enough to make potato chips a healthy part of your everyday diet.